January 20 marks National Cheese Lover’s day, and there’s no better way to celebrate than with a trip to your local cheese purveyor. But if you don’t know the difference between gouda and gruyere, don’t feel discouraged; a few basic tips are all you need to navigate a cheese shop like a pro. mental_floss recently spoke with cheese expert Adam Goddu, the general manager at a Murray’s Cheese location in New York City, about his best advice for eating, serving, and shopping for your favorite dairy-based delicacies. 1. DON’T BE AFRAID TO SAMPLE. It’s easy to feel overwhelmed when browsing the selection at a cheese store. Unless you walk in with a specific style and brand name in mind, choosing a product to take home can quickly turn into a guessing game. The only way to know for sure if you’ll like something? Taste it. So don’t be afraid to ask for samples while you shop. Many stores like Murray’s will gladly offer free samples to any customer. Take full advantage of the offer until you taste a cheese you love. 2. VARIETY IS THE KEY TO A GOOD CHEESE PLATE. A cheese plate sounds like a simple, hassle-free dish to prepare for company—until it's time to choose what actually goes on it. Luckily, Goddu has some simple advice to guide you towards assembling a restaurant-quality plate of fromage for any occasion. “Our motto is mild to wild,” he tells mental_floss. His recommendation: Start with a soft, creamy cheese and gradually work your way up to include firmer textures and bolder flavors. On the opposite end of the mild spectrum, Goddu suggests something funky like a blue cheese. And don’t feel pressured to have every style of cheese represented on your plate— take the number of people you’re feeding into account when deciding on how many cheeses to feature. 3. LEARN HOW MILK TYPE AFFECTS FLAVOR. Cows aren't the only animals that produce milk for cheese. The type of milk that’s used in the cheese making process has a big impact on the final product, and understanding this makes navigating a cheese shop a lot easier. The major factors in distinguishing between different types of milk are their protein and butterfat content. Goat’s milk has the lowest butterfat percentage, which tends to yield a product that’s more tangy and acidic. On the other hand, water buffalo milk has the highest amount a butterfat which lends itself to rich, creamy cheeses like mozzarella. Cow’s and sheep’s milk cheeses fall somewhere in between. 4. COUNTRY OF ORIGIN ISN’T AS IMPORTANT AS YOU’D THINK. You’ll be hard pressed to find a cheese expert who still insists all good cheeses come from Europe. Creameries in states like Vermont and Wisconsin churn out products that have established the U.S. as a serious player in the international cheese scene. It’s true that there are styles like Manchego in Spain and Parmesan in Italy whose origins are integral to their identities, but those aren't the only cheeses worth exploring. Goddu encourages people to experiment with different styles of cheese and see what they prefer without getting hung up on the country on the label. 5. PICK SPECIFIC CHEESES FOR COOKING. 6. 'RAW MILK' CHEESE IS NOTHING TO STRESS OVER. Depending on who you ask, raw milk cheese is either the equivalent of bioterrorism or dairy in its most perfect form. Perhaps unsurprisingly, neither of these viewpoints get it quite right. The first thing worth noting is that raw milk cheese, or unpasteurized cheese, must be aged at least 60 days before it can be legally sold in the U.S. So in terms of harmful bacteria, that shouldn’t be too much of an issue as long as you’re buying it above the table. As far as taste goes, Goddu says there are other details in the cheesemaking process that are far more significant than whether or not the milk is pasteurized. “I’ve had hundreds of delicious pasteurized cheeses,” Goddu says. “There are some people who insist on only having raw milk because they feel that the pasteurized just doesn’t live up to the full potential, but personally I think pasteurized is just as good.” You should be open to raw milk, but don’t plan your purchase around it. 7. CONSIDER YOUR FOOD PAIRING. Even the most basic cheese snack calls for something to eat it on. Crackers are a classic option that come in numerous varieties, but Goddu prefers to eat his cheese on bread. He says he appreciates the deeper dimension of texture you get with a crusty slice of bread, and all those lovely nooks and crannies are perfect for filling with some runny cheese. 8. CHOOSE YOUR SNACKS WISELY. No cheese plate is complete without carefully selected snacks to compliment the star attraction. Sweet condiments like jams, chutneys, and honey are classic companions for stronger cheeses like blues, washed rinds, and goat’s milk cheese. If you’re looking to add some texture to your plate, consider including items like dried fruits or nuts. Goddu suggests walnuts and marcona almonds. At Murray’s, they keep many of these specialty foods behind the counter for customers to try and see how well they pair with a specific cheese before they buy them. 9. FOR WINE PAIRINGS, WHAT GROWS TOGETHER GOES TOGETHER. You don’t have to be an expert in wine (or cheese) to master this time-tested pairing. According to Goddu, one helpful rule of thumb to remember is that wines pair well with cheeses produced in the same region. This is easiest to follow with products from parts of Spain, France, and Italy where they’ve been perfecting their wine and cheese making techniques for centuries. One example, endorsed by Goddu: Loire Valley Goat Cheese, which he says pairs perfectly with any wine from the area. 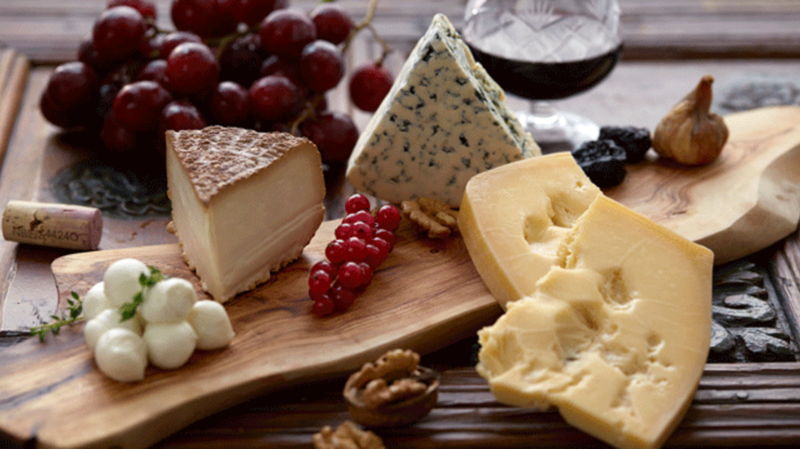 Some alternative strategies for enjoying wine and cheese include pairing likes with likes (drinking acidic wine with an acidic cheese, for example) or following the rule that opposites attract (pairing an intense, Alpine-style cheese with a fruitier wine). 10. YOU’RE PROBABLY STORING IT WRONG. According to Goddu, improperly storing cheese is one of the most common mistakes his customers make. You may be tempted to toss your wedge into a plastic bag once the wrapper has been removed, but this will only lock in moisture and promote the growth of bad mold. Instead, wrap your cheese in wax paper. This keeps your product protected while also allowing it to breathe. “Keep in mind, it’s a living thing,” Goddu says. Once it’s been properly packaged, place the cheese in your vegetable crisper or the lowest point in your fridge where it will stay nice and dry. Another big mistake you’re probably making is eating your cheese immediately after removing it from the fridge. Cheese is meant to be consumed at room temperature, and Goddu recommends bringing out your cheese at least an hour ahead of serving to give it the chance to warm up. This allows the butterfat in the cheese to settle, providing you with the full spectrum of flavors and textures. To make sure it stays fresh, you can also leave it in the wax paper until the last possible moment. 12. HAVE THE RIGHT TOOLS FOR THE JOB. After picking out the perfect cheeses for your soiree, the last thing you want is to come home to find you have nothing to serve them on. Keep a tray in your kitchen that’s large enough to showcase your cheese selection as well as any tasty nibbles that might go well with it. When slicing up your spoils, Goddu recommends using a paring knife or anything with a sharp, sturdy blade for firmer cheeses. For a softer cheese like brie, any standard kitchen knife will do. 13. KEEP SOMETHING EFFERVESCENT ON HAND. When enjoying cheese on its own, you want to make sure you choose the right drink to wash it down with. “Anything with effervescence to me is an outstanding pairing with the cheese,” Goddu says. “[It] just kind of clears the palate.” To best cleanse your taste buds between each bite, he recommends reaching for a glass of wine, cider, or the brew of your choice. 14. KNOW THERE ARE OPTIONS FOR BEGINNERS. If you don’t consider yourself a cheese lover but are open to broadening your dairy-based horizons, there are plenty of gateway cheeses out there for you to try. Challerhawker is one of Goddu’s personal favorites and it’s one he recommends for beginners. “It’s insanely complex, nutty delicious, and not funky or overpowering at all,” he says. “It makes the best grilled cheese you’ll ever have in your life.” He also suggests exploring water buffalo milk cheeses which tend to have a milkier, more mild flavor profile. 15. BUT DON’T BE AFRAID TO VENTURE OUTSIDE YOUR COMFORT ZONE. For people who’ve already sampled their fair share of cheese products, challenge yourself to pick up something a little adventurous on your next trip to the store. Washed rind cheeses are often the last style people venture into because they tend to be, well, stinky. Goddu says shoppers shouldn’t allow this to turn them off, as the smell isn’t always an accurate representation of the flavor. “In reality, the bark is usually much worse than the bite,” he says. “The scent is really the wash that’s coming off of the outside of the cheese, but once you get in there the flavors are just outrageous.” Moral of the story: don’t judge a cheese by its odor.